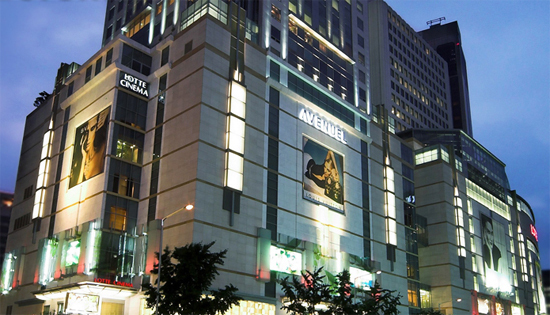 Avenuel, the Luxury Souvenir Shop in the Lotte Department Store has approximately 63 luxury shops from the 1st floor to the 9th. The concept is to realize oasis inside city; each floor is decorated with the cultural theme as the concept of garden & gallery. Poems, wise sayings, and beautiful sentiments are engraved in the interior and the 1st floor is organized with artistic sculptures in a wide space. At the entrance of the 1st floor, familiar luxury shops, Louis Vuitton, Chanel, and Bulgari, etc., are settled in. This place is designed to create an illusion as if the customers are actually at a famous boutique department store in a foreign country with the charming and unique interiors. This department store is aiming to become a cultural space where people can feel culture and the trend instead of a plain shop selling expensive products.